Malware spam: "Bank payment" / "sarah@hairandhealth.co.uk"
This fake financial spam does not come from SBP Hair and Health but is a simple forgery with a malicious attachment. Please find attached a bank payment for £3083.10 dated 10th June 2015 to pay invoice 1757. With thanks. 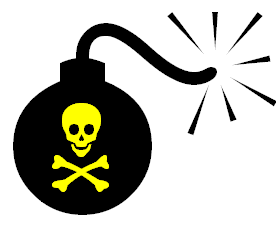 The Malwr report indicates that it drops a Dridex DLL with a detection rate of 4/57. Malware spam: "Colin Fox [colin@nofss.co.uk]" / "Invoice 519658"
This spam is not from Norwich Office Supplies but is instead a simple forgery. They have not been hacked (even if their website says they have). The attachment is Sales Invoice 519658.pdf [VT 2/57] This spam drops the Dridex banking trojan, but unlike other recent runs the attachment is a PDF file rather than an Office document. In fact, the PDF file contains a script that generates and drops a Word document named 6.doc [Malwr report, Payload Security report] [VT 4/55] which in turn contains a malicious macro that looks like this [pastebin]. In addition, the Malwr report says that it drops a Dridex DLL with a detection rate of 4/57. 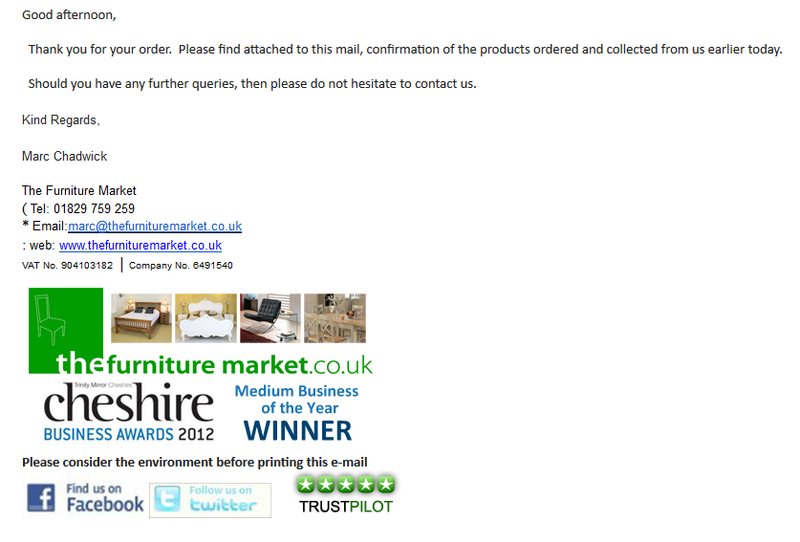 This fake order confirmation is not from The Furniture Market (thefurnituremarket.co.uk). 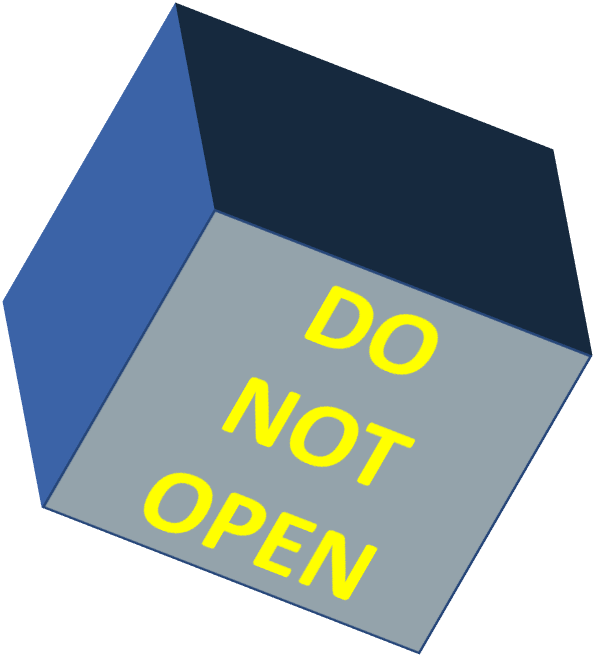 It has a malicious PDF file attached to it that you should not open. 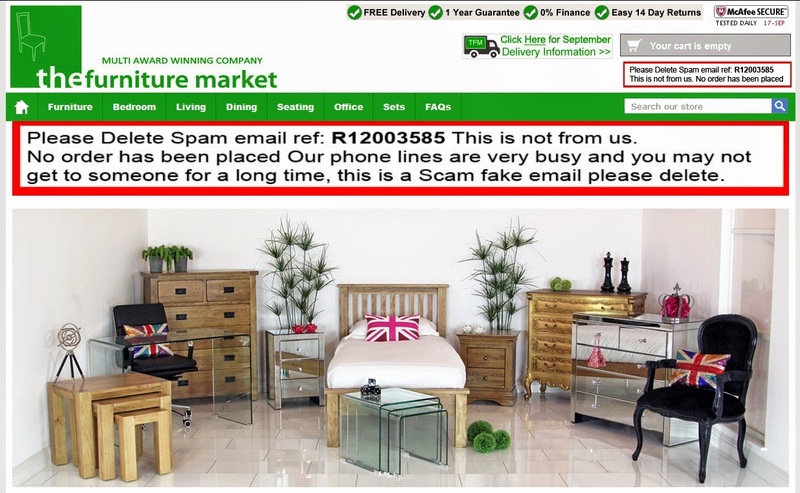 The Furniture Market's computer systems have not been compromised. Thank you for your order. Please find attached to this mail, confirmation of the products ordered and collected from us earlier today. Should you have any further queries, then please do not hesitate to contact us. It is trivially easy to fake who an email message is "From", and this email looks very convincing which makes me suspect that the bad guys have based it on a real message, possibly harvested from a hacked computer. The attachment is IR12003585-001.pdf which is a malicious PDF file with a VirusTotal detection rate of 10/54. The VT report indicates that it is using vulnerability CVE-2013-2729 to execute malicious code. If you are using an up-to-date version of Acrobat Reader (or an alternative PDF reader) then there is a good chance that you will be OK. The Furniture Market gets considerable kudos in my book for being very on the ball and having a great big warning notice on their site. Hopefully they are just as efficient when it comes to delivering furniture! Please see attached copy of the original invoice (Invoice_7104304). Attached is a file sage_invoice_3074381_09042014.pdf which is identical to the payload for this Companies House spam circulated earlier. 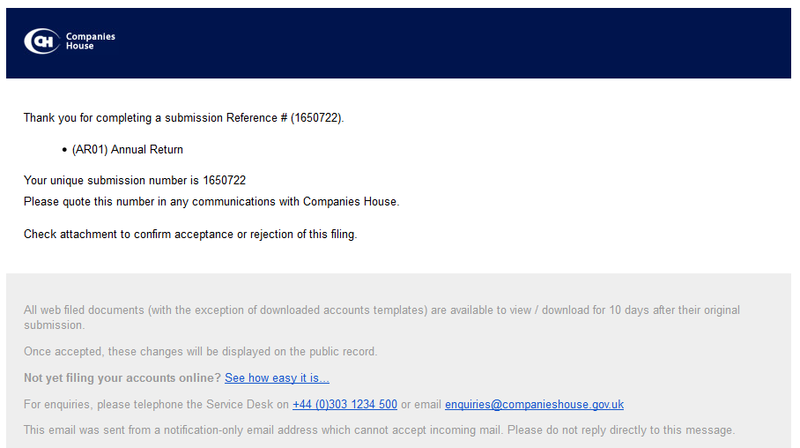 This fake Companies House spam comes with a malicious attachment. Thank you for completing a submission Reference # (1650722). Check attachment to confirm acceptance or rejection of this filing. 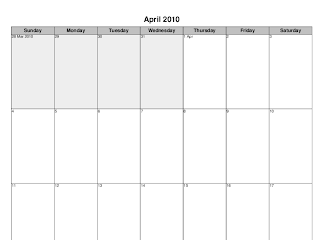 All web filed documents (with the exception of downloaded accounts templates) are available to view / download for 10 days after their original submission. Once accepted, these changes will be displayed on the public record. This email was sent from a notification-only email address which cannot accept incoming mail. Please do not reply directly to this message. Attached is a malicious PDF file ar01_456746_09042014.pdf which has a VirusTotal detection rate of 5/54. The Malware Tracker report shows that this attempts to exploit the CVE-2013-2729 flaw that was patched over a year ago.. so it may well be that if your version of Acrobat is up-to-date then you will be OK, as you will probably be if you use another PDF reader. Good morning,attached is your statement. Attached is a file Customer Statements.PDF which has a VirusTotal detection rate of 6/55. Analysis is pending. 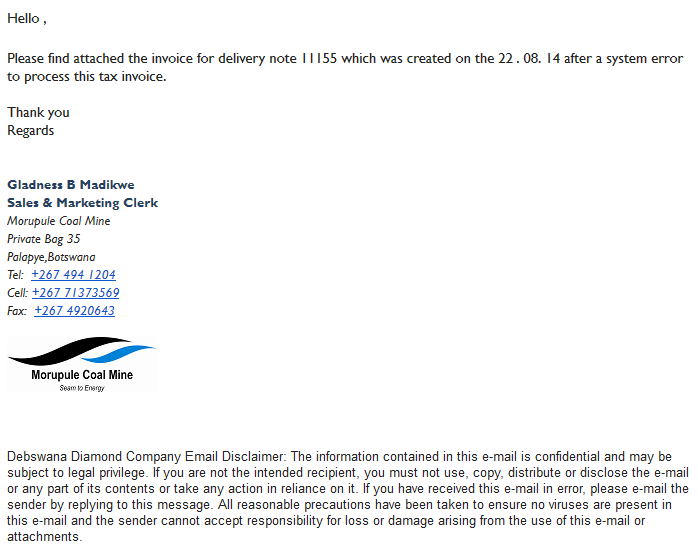 This fake invoice spam claims to be from a (real) coal mine in Botswana. But in fact the PDF file attached to the message is malicious. Please find attached the invoice for delivery note 11155 which was created on the 22 . 08. 14 after a system error to process this tax invoice. Debswana Diamond Company Email Disclaimer: The information contained in this e-mail is confidential and may be subject to legal privilege. If you are not the intended recipient, you must not use, copy, distribute or disclose the e-mail or any part of its contents or take any action in reliance on it. If you have received this e-mail in error, please e-mail the sender by replying to this message. 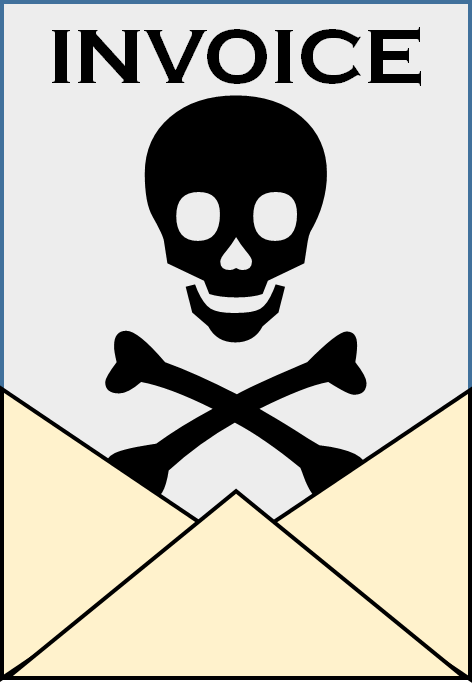 All reasonable precautions have been taken to ensure no viruses are present in this e-mail and the sender cannot accept responsibility for loss or damage arising from the use of this e-mail or attachments. Neither the Morupule Coal Mine nor the Debswana Diamond Company mentioned in the disclaimer are anything to do with this spam email, in fact it originates from a hacked machine in India. The attachment has a VirusTotal detection rate of 5/54. My PDF-fu isn't good enough to tell you what this malware actually does, but you can definitely guarantee that it is malicious. Please find attached your invoices for the past months. Remit the payment by 07/30/2014 as outlines under our "Payment Terms" agreement. The attached file (in this case invoice_7564675_07292014.pdf) contains an exploit with a VirusTotal detection rate of 7/53. I haven't had a chance to analyse the exploit myself yet. This attachment contains correspondence relating to your customer account with Lloyds Bank Commercial Finance Ltd. If you have received this email in error please contact the individual or customer care team whose details appear on the statement. This email message and its attachment has been swept for the presence of computer viruses. Ensuring that your PDF reader is up-to-date may help to mitigate against this attack. A classic post over at the F-Secure blog where some muppet "hacker" accidentally emailed out their malware generation tool and put it right into the hands of anti-virus researchers. To quote F-Secure, Hey, thanks. Keep up the good work. On a more serious note, this tool is used to generate trojanised PDF files. So go and check that your version of Adobe Reader is up to date right now before doing anything else..